This heavy duty blow-molded cooler has it all! Extra-thick foam walls and insulated lid for the best cooling performance proven to hold ice for 5 days at 90 Degrees. Convenient size for optimal performance. Heavy duty blow-molded construction with reinforced base for increased strength and protection. UV inhibitors protect the cooler against sun damage for extended life. Rust-resistant, stainless-steel hinge rods and hardware provide extended performance. Rubberized T-grip latches keep lid secure. 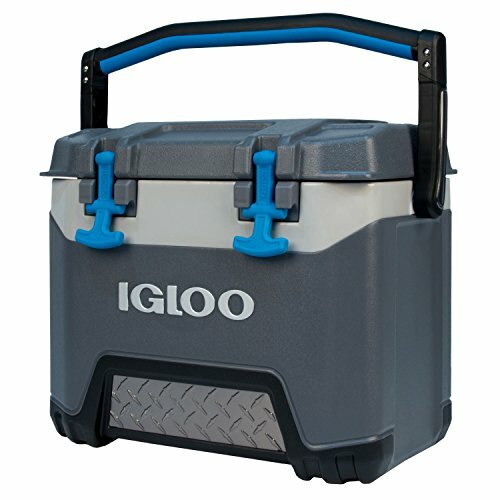 MaxCold body with 20% thicker foam and insulated lid provide advanced cooling performance and up to 4-day ice retention. Cool Riser Technology molded base elevates the cooler away from hot surfaces and improves cooling performance. Comfort grip, 3-point-grab handle for easy one-handed carrying. Built-in tie-down loops for securing cooler during transport. Integrated ruler on lid easily estimates your catch.